Unlimited free links, no sign in required. Upgrade to autorecord. 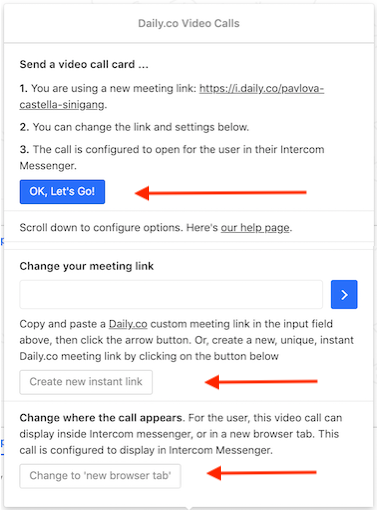 Daily.co is unique 1-click video calls in Intercom. It's zero friction for free unlimited calls. You don't even have to sign up or create a Daily.co account. Now you also can upgrade to automatic recording, to keep better customer records, gain more insight into sales and support, and train better. 🎁 The Daily.co app now has complete browser support! Daily.co works on Chrome, Edge, Firefox, Safari, iOS Safari and Android Chrome. Use Chrome to record or screen share. 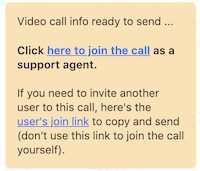 To clarify, your customer doesn't need to use Chrome to see your screen share or be recorded But if you want them to screen share, configure the call to open in a browser, and tell them to use Chrome. To record, you also need to be logged in, so you can get your file. 4. After clicking OK, you'll see 2 things, in your agent Intercom thread. 5. You'll also see the draft customer invite. When you're ready, Click the blue Send button. The customer can't click to join until you send this card. 💥 Done! You and the customer both are in the call. Free - In the Settings card, scroll down to Change link. Click the Change link button. Free - Want to use a custom link? You can paste a Daily.co custom link in that link field in the Change link section. Then click the chevron, which is the white arrow/blue box. Upgrade - Contact us, to have the app automatically create a custom subdomain link. Notify when customer joins, with a note. 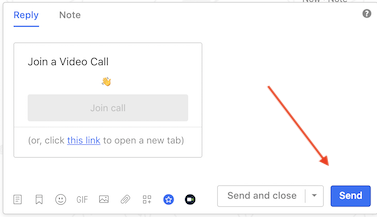 When a user joins a call, you can customize the app so a note is posted to the conversation. Did your customer now click Allow, for cam access? They might have to unblock, let us use their camera. Learn more. Or ping us for help. Every Daily.co video call has screen sharing. The first time you screen share, you're asked to install the Chrome extension. Takes a few seconds. Learn more. 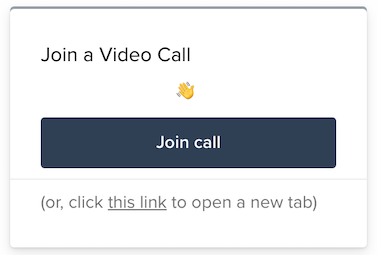 Again, for a customer to screen share, please have them join the video call in a browser. Tell them to use Chrome. Learn more about screen sharing. Poor network? You and/or customer can mute cam, to preserve bandwidth. If you're having problems in general, your browser may not be talking to your OS. Refresh. Or ping us for help. Cam. A customer doesn't need a cam to join a call, if you just want to screen share (and don't need to see them). Just tell them to click Allow when asked to "allow" a cam. About us: Daily.co is the most powerful 1-click video calling platform. We build easy, no download calls, which you can use on your computer, mobile, big screen TV, or your own product, with our API. Learn more about us here, and ping us anytime for help! We use Intercom, ourselves. So you always can reach us for help at our website chat! Cheers.